Snorkeling with sea lions, beach bonfires, cocktails to celebrate the full moon, stand up paddle boarding on glassy blue water, desert mule rides and not a port of call in sight. This is not a cruise. It’s an Un-Cruise.Unhurried. Unconventional. Unbelievable. When one of my favorite adventure travel providers, American Safari Cruises, changed their name recently to Un-Cruise Adventures, I wasn’t sure if I liked the new moniker. And, when they added an 86-passenger ship (Safari Endeavour) to their fleet of small luxury yachts, I wasn’t so sure about that either. I needn’t have worried. 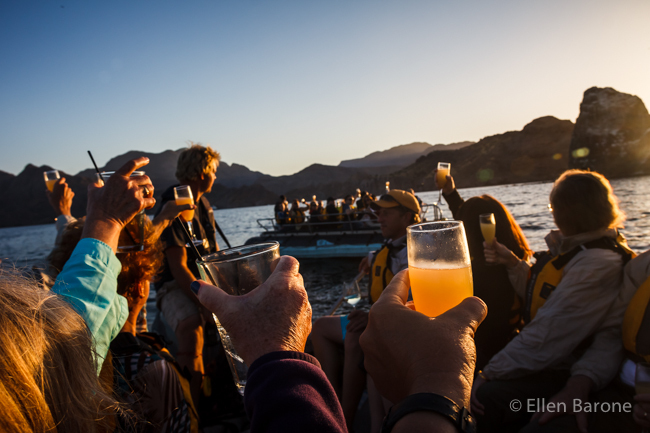 I’m back from 7-days aboard the Endeavour in Baja California’s nature-rich Sea of Cortés, and while the name is different and the ship is bigger, the all-inclusive ease, attentive service, adventurous spirit, and unforgettable experience remain at the forefront of the voyage. 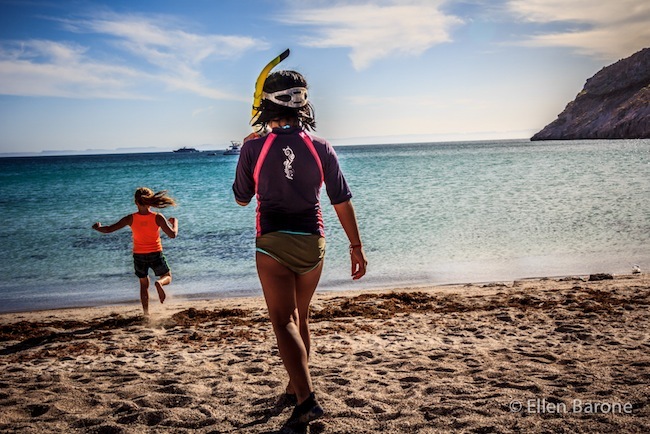 Discover ten trip highlights and the essence of Baja’s magic and the Un-Cruise experience in the following photos and videos. Returning to the ‘Mother Ship’ each day after a hike, a snorkel, stand up paddle boarding, kayaking or exploring by skiff, feels like coming home. Only this home has an attentive staff to greet you with a clean towel and a refreshing drink, hot tubs, saunas and a massage to soothe any aching muscles, gourmet meals, an open spirits and wine bar, and one of my favorite features, a bedside flat screen TV that plays real-time video from the ship’s bow-mounted camera. One night I came out of the shower to see bow-riding dolphins trailing florescent green phosphorescent wakes on the screen. How cool is THAT? Safari Endeavour, Los Islotes, Sea of Cortés. 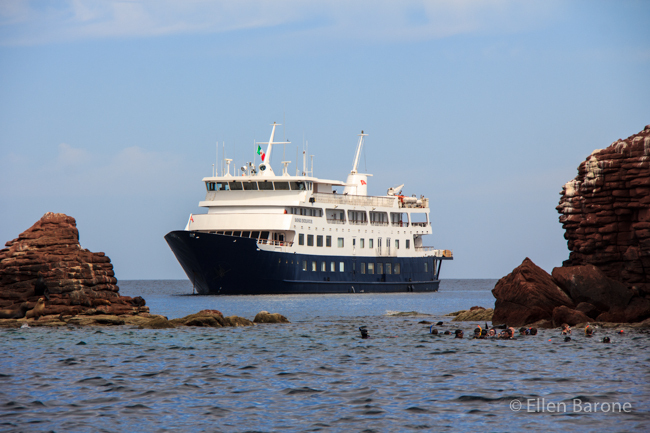 Safari Endeavour, Bahia Agua Verde, Sea of Cortés. 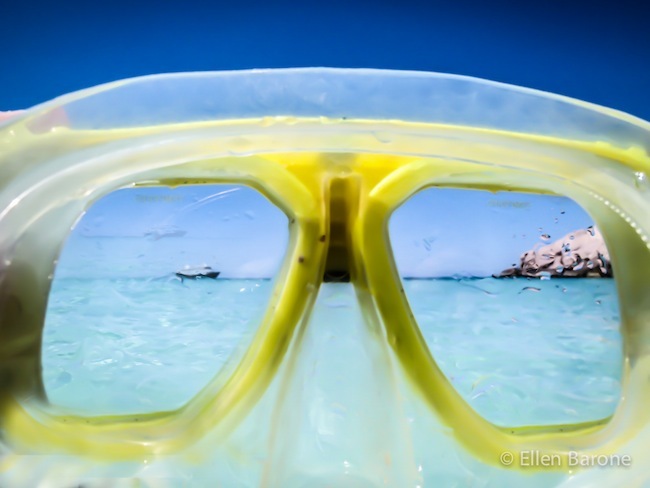 Snorkeling highlights many of the days in Baja where the marine life is plentiful, the water cool and inviting and the snorkel gear and wet suits provided. After snorkeling you can either swim back to the ship if you’re eager for more exercise, or grab a ride with the skiff that’s always hovering nearby with a crew member stationed to keep an eye out and make sure all is well. Snorkeling, Playa Ensenada Grande, Sea of Cortés. 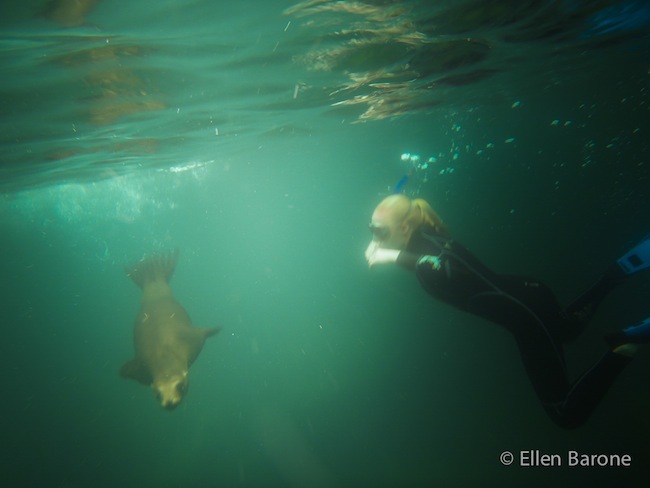 One of the most memorable experiences of the voyage is snorkeling with juvenile sea lions at Los Islotes Sea Lion Colony. The young pups are playful, curious and eager to show off their acrobatic swimming skills. As if it’s a game of tag, they tease and circle and unexpectedly pop up in front of your face mask to look you in the eye. This opportunity to frolic and interact with wildlife is as exhilarating as it is extraordinary. 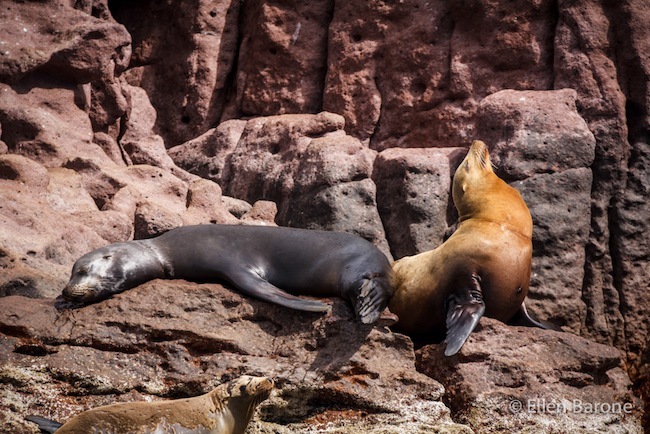 California sea lions, Los Islotes, Sea of Cortés. Swimming with sea lions, Los Islotes, Sea of Cortés. Whales always draw a crowd to the bow. The Sea of Cortés plays host to nearly every species of whale on the planet - sperm whales, fin whales, killer whales, California gray whales, and the world’s largest animal, the blue whale. On this afternoon, a humpback whale hung around the ship for a good half hour, keeping us mesmerized every time it came up to breathe or gave us a flash of its massive tail on its way back down. Humpback whale, Safari Endeavour, Sea of Cortés. Our voyage was one of Un-Cruise’s specialty Kids in Nature departures offered for families traveling with children 12 and younger. For me, the trip was greatly enhanced by having the kids onboard. They were well behaved, smart, and curious, and their enthusiasm was contagious. The crew created kid’s only treasure hunts, games and beach activities to keep them active and entertained when adult activities were unsuitable - giving parents and grandparents plenty of downtime, too. Kids at play, Sea of Cortés. Exploring tide pools, Sea of Cortés. Watching for wildlife from the wheelhouse, Safari Endeavour, Sea of Cortés. I’ve been eager to try stand up paddle boarding, the newest rage in watersport activities. And what better place to begin than the glassy blue waters of the protected bays of the Sea of Cortés? The couple in the below photograph is from Petersburg, Alaska, and like me, they thought paddle boarding might be fun. But in Alaska, not so much. This was their first day on the boards and neither one took an unintentional spill. I also got out on the boards and LOVED it. The bear paw foot markers were a graphic reminder that the boards, like the whales, would soon migrate to Alaska, where adventurous Un-Cruise passengers would take them out in iceberg strewn waters. Better to learn in balmy Baja, if you ask me. Stand up paddle boarding, Bahia Agua Verde, Sea of Cortés. Stand up paddle boarding, Sea of Cortés. Cocktail hour aboard the Endeavour is usually scenic enough with drinks and snacks served on the bow or sun deck. But it was the eve of a full moon, so the crew decided it might be nice to cruise out in the small boats, kill the engines, and take in the moon rise from there. Without a hint of what they had planned, they simply suggested we take a sunset spin. It wasn’t a hard sell, especially once they popped the Champagne and pulled out the hors d’œuvres. Another amazing memory to carry home with us. 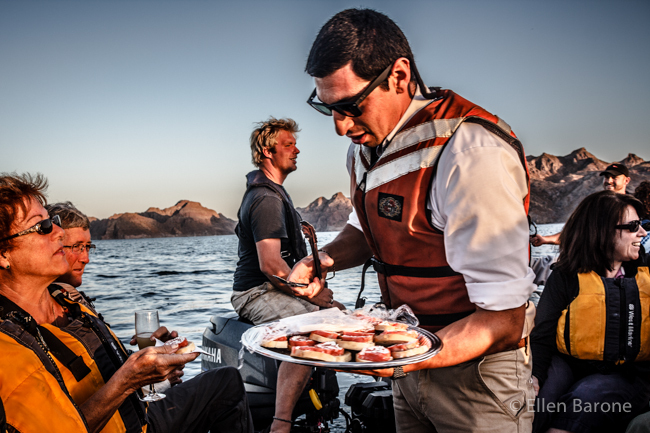 Ship bartender, Gerry Jimenez, serves sunset cocktails and hors d’oeuvres aboard the skiff, Sea of Cortés. Full moon rise, Safari Endeavour skiff, Sea of Cortés. One of the nice things about Un-Cruise Adventures is the emphasis they put on developing meaningful relationships with the people who inhabit the remote places they visit. 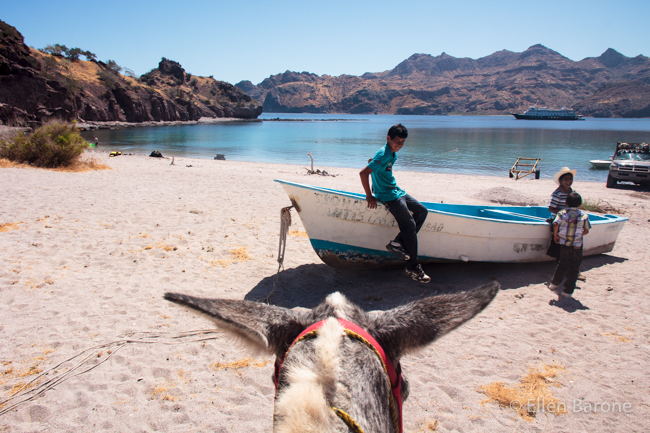 Together with local rancher, Alejo Romero and his family, they offer passengers a unique means of traveling farther afield and seeing what’s over the mountain ranges that flank the Baja Peninsula and Sea of Cortés on a desert mule ride. Tragically, shortly after our voyage, the Romero family lost their home to fire. In an effort to help, the company created a support fund. Click here to learn more. Exploring by mule, Bahia Agua Verde, Sea of Cortés. Mule eye view, Bahia Agua Verde, Sea of Cortés. It’s all about the natural world on an Un-cruise. No shopping. No Vegas-style casinos or shows. Just hanging out with Mother Nature in all her glory. There’s an abundance of bird life - brown pelicans, red-beaked oyster catchers, and the ubiquitous laughing gulls. It’s common for dolphins to tag along and swim the bow. And, anytime wildlife leaps out of the water, like the mobula ray in the image below, it’s awesome. And then there’s the landscape itself - mountains and sea, sunsets and sunrises, cacti and flowers so delicate and fleeting that they may bloom for only one day, or even an hour. Mobula flying ray breaching, Sea of Cortés. Sunrise, Puerto Escondido, Loreto, Sea of Cortés. 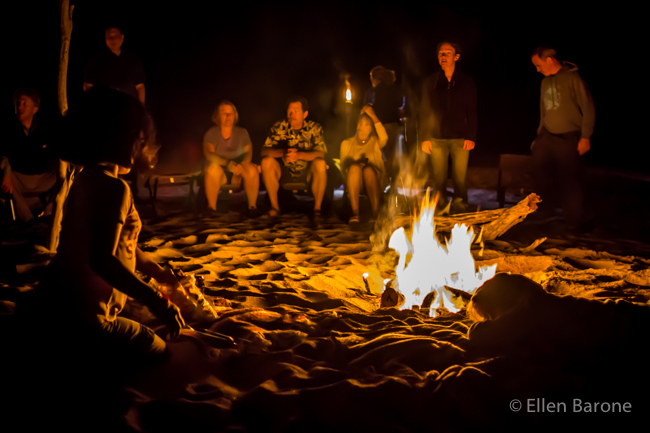 There’s little that signifies a vacation better than swapping stories around a beach bonfire. Throw in a mug, or two, of Mexican hot chocolate made from rich dark chocolate, spicy cayenne pepper, sweet cinnamon, five ounces of tequila, and a shot of kahlua, and you REALLY know you’re on vacation. Top it off with a Hawaiian fire dance by Hawaii native and ship wellness officer, Leah Webb, and you know you’re on an Un-Cruise. Roasting marshmallows over, beach bonfire, Sea of Cortés. What about you? Do you think an Un-Cruise is right for you?Share a comment below, on my Facebook page, or tag me on twitter to continue the conversation. I’d love to hear your thoughts or answer any questions. Un-Cruise Adventures’ fleet of eight boats carries 22-88 guests on Active, Luxury and Heritage Adventures. What began in 1997 as yacht cruising in Alaska, pioneered by American Safari Cruises, has since expanded into Mexico’s Sea of Cortés, Columbia & Snake Rivers, Hawaiian Islands, and Coastal Washington & British Columbia with hands-on small boat explorations. Un-Cruise Adventures, under the parent company of InnerSea Discoveries, is a member of Trusted Adventures, dedicated to the highest standards of small-group travel and to giving back to the places visited. Connect with Un-Cruise Adventures at Un-Cruise.com and on Facebook and Twitter. Ellen Barone has been creating words and images for travel and tourism since 1998. She co-founded and publishes the travel blog YourLifeIsATrip.com and is currently at work on her first book "I Could Live Here".